Picking a name for a painting can be a daunting endeavor. I fully agree with Robert especially on that last bit. Sometimes I labor over the name far more than I ought to. Yet, sometimes the name presents itself midway through the piece or even immediately upon completion. For my painting “Facing the Impasto-Bull”, I had been kicking around a few ideas in my head as I worked. I liked the idea of using a pun of some sort. “My Bull Oney” for example. During the few painting sessions that I faced the canvas with an oversized Longhorn staring back at me, it became clear to me what moniker this one would receive. Let me back up just tiny bit. 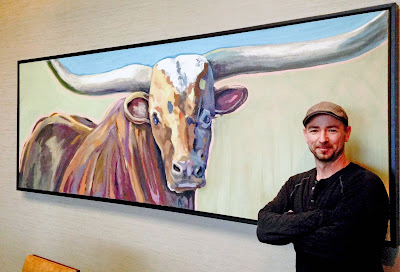 “Facing the Impasto-Bull” is a piece I did as a request (not a commission BTW*) for the owners of an upscale resort’s steakhouse restaurant in Austin, Texas. It was to be the only artwork on display in the overflow dining/banquet room. It would mount on a largish, freestanding wall that faced a windowed wall which overlooked Lake Travis. The subject and the dimensions of the canvas were selected specifically for this wall and this room. During this period I was working on several other projects concurrently. Many of which were providing me some difficulty as I faced rejection at what seemed like every turn. ( e.g. ; I needed a part for an installation project and was told by several suppliers and vendors that “It couldn’t be done” or “That would be too costly"). The “no’s” were mounting and the ambitious installation project was presenting itself to be nearly impossible. I was frustrated but not yet defeated. By contrast, the time that I spent painting the bull was easy. The colors came easy, the composition was a breeze, it all seemed to flow smoothly. Near the end of the painting of the bull I did what I always do with paintings. I sat at a distance (as much of a distance I could get from a 9’ canvas in my humble studio) and stared at it. I looked for compositional errors, tonal balance, harmonious color use throughout the painting, missed details and anything that “felt” to be missing or left out. The conclusion was, that it was done. Standing before it to get a closer look somehow gave me strength. If you’ve never been face to face with a live Longhorn, I’ll tell you, the beast is big… huge in fact. So staring at my rendering of a larger than life giant and feeling the power of the bull osmotically wash over me, I felt in that moment like I could face any immoveable object with confidence. Any improbable project, or task could be overcome by facing it head on. This bull painting became a metaphor for my current and any future challenges. To bring this back to the title of the painting, I’ll add for those who aren’t versed in artist-speak. Impasto is a painting technique that gives a painting texture through the application of thick paint and texture medium. Getting from facing the impossible to "Facing the Impasto-Bull” was a no-brainer. How do you select a title for your artwork? Have you ever purchased or not purchased an artwork because of its name? * "Facing the Impasto-Bull” is part of the Prairie Project Collection and is on indefinite display at Masterson's Steakhouse in the Lakeway Resort and Spa in Lakeway, Texas. The original oil painting, as well as a limited number of hand signed Giclee' editions are available through the Prairie Project website.